Do you know what’s grea? Another chapter! That’s right, a full Chapter 3 of MGP is now up for your reading pleasure. And I hope you like dialogue because there is lots of it. Or… well there is a lot of dialogue in the second half. Not the first. Well, not the beginning. How about I just let you read it? I want to thank those who have donated towards the “Taralynn Wants To Commission More Art” Fund. We’ve had $30 donated and it’ll be going straight towards a new piece of commissioned artwork. What type of art would people like to see? Send me your suggestions and I’ll pick the one I like the best. I accept either comments or email suggestions. Please remember that it needs to be story based. I’m on a more regular schedule of writing now that tax season is over. If you want to be kept up to date on my progress, like me on my twitter feed, @TaralynnsDesk. 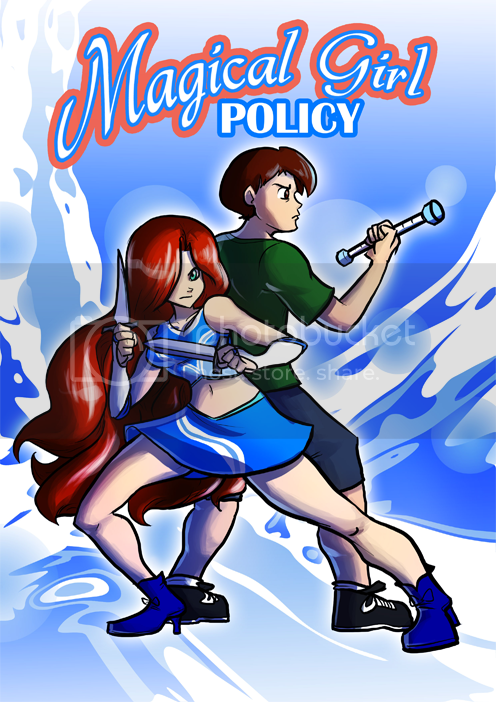 I have now posted Chapter 2 of Magical Girl Policy and this one was a doozy. I restarted the chapter two or three times. I guess it’s just the perfectionist in me but I finally got it the way I wanted it to turn out. Sorry it took so long. I didn’t mean for it to but, well, maybe I should stop being so picky and whatnot. I just really wanted to make sure I got every voice correct. In other news, I don’t know how many of you saw it but I commissioned some artwork from the venerable Ian Sampson and it will be going straight into the gallery. Isn’t this thing the coolest!? I imagined it as sort of a cover page for if MGP were a manga. I’m using it as the donation image as that is what I plan to use donations for: more artwork. I love this idea and think it’s a great use of the funds. I hope you agree ^_^ If you can only donate a single dollar, it will help me to commission more art which I feel compliments the story immensely. As a side note, a lot of people have messaged me asking me for the links to the old MGP stories and I haven’t forgotten about you. I’m going to get to that today. Just want to make sure you guys know I haven’t forgotten. Well, I’ll stop rambling and let you get to reading. I hope you enjoy reading it as much as I enjoyed writing it. A lot of you have commented and it’s been greatly appreciated! I say thanks to all the kind words, “welcome backs”, “we missed yous”, and general niceness that has come my way. I wanted to respond to all of you but haven’t found the time. One common question I’ve received is, “How often do you expect to be updating in this brave new Magical Girl Policy world?” The answer to that is… well I was hoping to find that out this past two weeks by seeing what my schedule could handle but my teeth had other plans. You see, a couple Fridays ago my tooth started bothering me. Bothering me so much that I, literally, couldn’t sleep. I tried to get in to my dentist on Saturday for an emergency appointment but found he was out of town for the day. He’s a close friend of my family though and he said he’d get me in Sunday morning. No problem, I figured. I’d get some of that toothache gel, a sleep aid, and lots of painkillers and get to sleep. No dice. Sunday rolls around and I’ve had no sleep whatsoever. Driving to the dentist office was scary as the pain of my toothache was the only thing keeping me awake. Turns out I need a root canal in the worst way. My dentist does it for me and the pain feels immediately better. He offers to get me a prescription for some more potent painkillers but I turn him down because, hey, I feel great. This is lesson #1 from the story: When a dentist thinks you’ll need prescription strength painkillers: TAKE THEM! When the novacaine wears off that night, guess who can’t sleep? I go back in Monday and this time its an even scarier drive because I’m in the middle of rush hour and I can feel myself nodding off. Dentist gets me the more powerful meds, I drive to my family’s house (in the same town as my dentist), take the meds, fall asleep around 10am, wake up at 3am the next day. I wish this were the end of the story but on Wednesday night, through the painkillers, I start feeling terrible pain in a DIFFERENT TOOTH! My dentist fits me in and examines my other tooth to find my filling in said tooth had just cracked. He gets me even MORE powerful painkillers so I can sleep and fixes it the next day for more dental work. I’d say this means I’ve had terrible luck the past 10 days with my teeth, but it’s really my own fault. During my long stint of underemployment I avoided the doctor and dentist because, well, money. Which means I’ve been a good 15 months without seeing my dentist. I made my bed and now I’m laying in it with some hefty dental bills (thank goodness I opted to purchase dental insurance a few months back!) and pretty much all my sick time at work used up for the year already. The moral of the story is PLEASE see your dentist regularly so you don’t go through the Hell I’ve been through. I want you to learn from my pain as I’m still trying to catch up on my sleep I’ve lost and it hurts to bite down too hard. This all could have been avoided and had I just gone when I should have you’d have chapter 2 by now. On the story front though, now that my teeth shouldn’t be delaying me for the foreseeable future, I’m going to get started on the next chapter tonight. Realistically though, I have some other commitments coming up Thursday and Friday that will really be challenging my time. I wouldn’t expect this week to be the week I post, but the week after that. PS: GO SEE YOUR DENTIST!!! The Return of Taralynn- This time, it’s personal! Hello everyone, tales of my demise were greatly exaggerated. So what’s been going on? Well, I’ll get to business first and then we can go on to personal stuff. I’m starting Magical Girl Policy over. I have been feeling the need to start it over for a long time with a different setting but have been putting it off because of how much work it would be. I knew this going in though and have been dragging my feet. So I have officially, thanks to the gentle nudgings of Pip (more like constant poking :P) and Kami I have gotten MGP started over. Say hello to the new MGP here. I have the first chapter up and everything. I know, shocking, right? What are the changes you ask? Well, I feel my writing style has really improved over the past few years. So I feel you’ll see a higher quality story to begin with. Next, I’ve moved the school setting from the Peavy Academy (a private high school) to college years (Adamson University is the name of the place). I feel this change of setting is something that will improve the story as it removes some of the awkwardness I feel situations have had before, while adding new levels of awkwardness in others. Either way, each setting has its issues, but I feel the new setting will give me more options as a writer, and improve the story. So is this basically going to be the same story but in college instead of high school? Yes and no. A lot of characters are getting tune-ups as to what they are. Some are getting flat-out redesigns. And the background plot I was building up to before is now being completely dropped and changed. Now, no one ever got to see the background plot so… yeah. You guys may not know the big changes that have happened for a few chapters. But here is the crux of it, will I actually update frequently. I have not been very consistent with my motivations. I now have a full-time job which I feel will help me keep steady with writing now that I’ve gotten going. I’m going to replace the donations button up top in favor of a progress bar that shows what my progress is on chapters that are coming up. As for donations, I’ve decided to use any donations people give me to commission art pieces for the story so your investments go directly into the story. I find a picture really adds something to the story and given how I’m changing up the looks of the team, it’s no surprise that I’d like pictures to help. Author TaralynnPosted on December 28, 2012 December 28, 2012 4 Comments on The Return of Taralynn- This time, it’s personal!